Cost/Amount: USD$7.25 for 1.2 grams. Sample baggies also available. 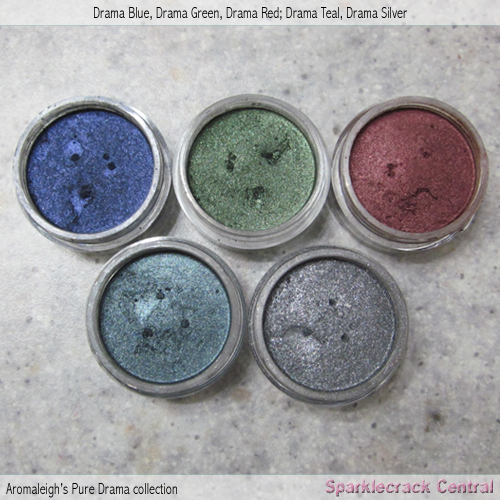 When I initially started buying Aromaleigh colors, I steered clear of this collection. I wasn't all that fond of blackened colors in general - I preferred rich colors with good pigmentation levels, as opposed to blackened shades. Turns out, the reason I was unfond of blackened shades was that most companies who tried to create dark colors, including Bare Escentuals, just didn't do that great a job of darkening their colors...so of course one ends up with a sooty shade with barely any color other than black. 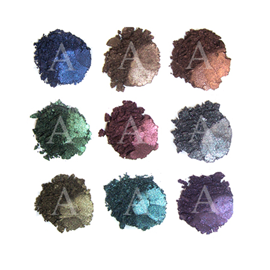 These colors are blackened, they even state that quite clearly...and they work best as liners, rather than as crease or contouring shades. But they're not sooty, they actually do have -=color=-. (Be still my heart.) I am more satisfied with these colors than I was with the Bete Noire colors - many of which are also blackened. There was another collection, the Drama Queen liners, that was essentially the same colors but with sparkle instead of metallic shimmer. 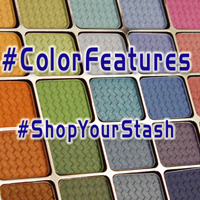 The one color I didn't get a chance at, because it never ever appeared in Aromaleigh v1's clearance-dropdown list after mid-November, was Drama Violet. But I got Green, Blue, Red, Teal, and Silver, and they're all gorgeous colors.